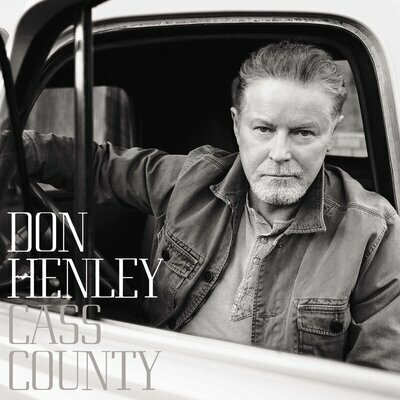 There are good reasons it might not feel right to describe Cass County as “Don Henley‘s country album.” That terminology could easily connote the carpet-bagging we associate with someone like Steven Tyler making his big country move; plus, no one of Henley’s stature likes to give in to the reductionism of genre this late in the game. But scroll through the Cass County credits, and you’ll see pedal-steel guitar listed on 14 out of 16 tracks. So maybe, just on that basis alone, it’s a safe enough categorization to make — just as long as we recognize that he’s not borrowing into the hybrid represented here so much as reclaiming it. To paraphrase an old Bono aphorism: The Garths, Keiths and Kennys of the world stole country-rock, and now Don Henley’s stealing it back. Henley hasn’t made many adjustments in his lyrical preoccupations — regret and acceptance, the passage of time, love’s fading and bloom — so the album is still more about taking the Long Road Out Of Eden than dirt roads. The real shift is in a degree of acoustic instrumentation not heard in his work since The Eagles’ classic sophomore album, Desperado. He still rocks it out a little, in a nervously sensual duet with Martina McBride titled “That Old Flame,” as well as in an upbeat album-closer called “Where I Am Now” that marks the first time he’s wrapped up any record, solo or Eagles, with a cheerful rocker instead of a rueful, end-of-an-era lament. But for the most part, Henley plays to his traditional ballad-singing strengths, albeit with a pinch more dobro and mandolin adding a sense of Southwestern regionalism to the mix. On paper, especially, a long list of world-class cameos further tilts the balance away from rock ‘n’ roll. Pretty much every living female country voice you’ve ever loved puts in an appearance, either as a duet partner — in the case of McBride, Miranda Lambert and Dolly Parton — or a featured harmonizer (Lucinda Williams, Lee Ann Womack, Trisha Yearwood, Alison Krauss, Ashley Monroe, two out of three Dixie Chicks). He also finds room to squeeze in menfolk Vince Gill, Merle Haggard and Mick Jagger. Looking at this list, you might simultaneously marvel at the assemblage of talent and worry that the album will sag under the sheer value-added weight. Happily, Cass County, named after the underpopulated area of Texas where Henley grew up, evokes a lonesome state of mind, too, without the all-star guest list turning the reflective material into too much of a party. Henley portrays the end of a marriage in “Take A Picture Of This,” a track that trades in the pedal steel for tympani on the way toward becoming a bit more Orbison-esque. “Too Much Pride,” meanwhile, has just enough of a wistful R&B feel to recall Ray Charles‘ 1960s excursion into country (and Western). “A Younger Man” looks at May/December relationships with a jaundiced eye, but it’s really a chance for Henley the known idealist to play Henley the cynic, telling a young woman that “If you’re lookin’ for believers in faith and hope and charity / Then you’re lookin’ for a younger man, not me.” The pluses and minuses of having a few years behind you similarly figure into the duet with Haggard, “The Cost Of Living,” as well as “Where I Am Now,” where the singer is actually able to opine that “Father Time is a friend.” Though the album ends on that anti-nostalgia note, he does turn the clock back to visit the title locale in the boyhood verses of the album’s most autobiographical number, “Train In The Distance.” Still, by the end of it, he’s a grown man who turns restlessly in his bed, wondering whether that far-off railway whistle is a beacon or an omen. Henley reportedly started recording Cass County years ago as a primarily covers-based project. The remnants of that approach are in the four bonus tracks sprinkled throughout the 16-song deluxe edition — none self-penned, all of them wonderful. The most notable of these is the Dolly Parton duet, on the Louvin Brothers hit “When I Stop Dreaming,” which finds Parton briefly stretching herself to become a raspy-voiced belter. If you’re foolish enough to settle for the standard edition, you do still get one cover — a contemporary one, of Tift Merritt‘s “Bramble Rose,” with Lambert and Jagger joining Henley as the world’s unlikeliest superstar power trio. As the reissue of Sticky Fingers recently reminded us, Jagger is one of the world’s great underheralded country singers, and it’s a treat to hear him revisit his C&W “roots” here. As for Henley himself, he’s 15 years removed from his last solo album, and seven years removed from The Eagles’ final attempt at a group record. So it makes sense that he’s finally left that ongoing garden party to head back to the desert. As Cass County proves, it’s fertile ground for him.